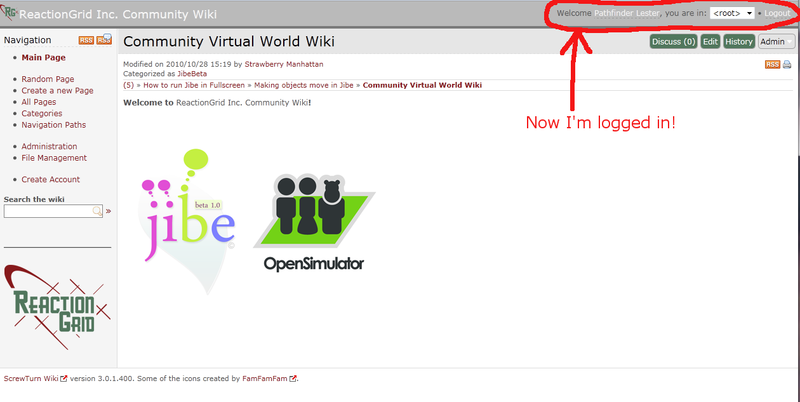 At ReactionGrid, we have a Community Virtual World Wiki that anyone can use to find information or add their own content. In a recent discussion on our Jibe-Unity3d Google Group, some folks were interested in organizing and sharing information they’ve learned on how to get started with Jibe and Unity3d. Our Google Group is the best place to have ongoing discussions and share ideas about Jibe, but the right tool for the job of organizing content is definitely our Wiki. So here’s a crash course on how to use it! You can find the ReactionGrid Community Virtual World Wiki at http://education.reactiongrid.com. You can also see a link to it on our homepage under the Support section. 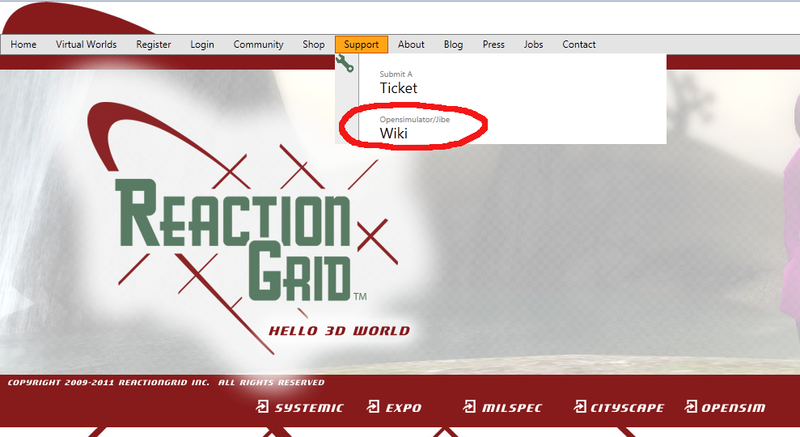 How to find the Wiki on our ReactionGrid.com homepage. – How do I log on to the Wiki? 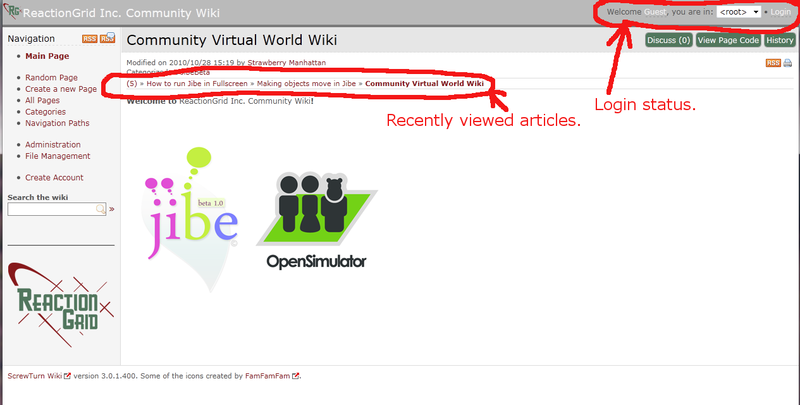 Anyone can view articles on the Wiki as a guest. But if you want to add or edit articles, you’ll need to log in. The Main Page of the Wiki. You can see in Login Status section above that I’m not logged in. You’ll also notice you can always see a handy list of the most recently viewed wiki articles, and a search option on the left in the Navigation section. Click on the Login link. If you already have a ReactionGrid account, just log in using your ReactionGrid avatar name and password. Or create a new account if you wish. There we go. I am now logged in and ready to create or edit articles! – Get Organized! Exploring the Categories. A good way to explore the Wiki is to look at the different Category links. Checking out the different Categories. If you click on the Categories link on the left, you’ll see a list of all the different Categories in the wiki. All articles about Jibe 1.x can be found in the Jibe1 category. We have a bunch of older articles in the JibeBeta category, but some of them are now out of date since we’ve officially released Jibe 1.x. We’ll be updating these older articles over time and moving them to the Jibe1 category. But the important thing to remember is that all new articles about Jibe1.x should be placed in the Jibe1 category. A list of all the articles in the Jibe1 category. – Organizing an article in the Jibe1 Category. 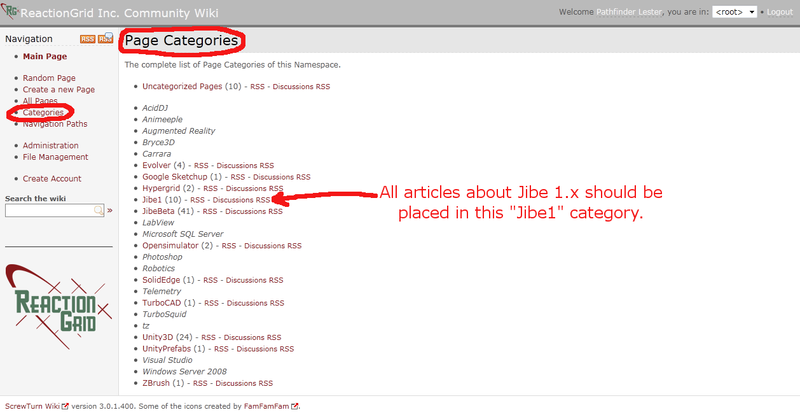 When you are adding a new article about Jibe to the wiki, it’s a good idea to lay it out in a way that makes it easy for people to find additional articles in the Jibe1 category. A simple way to do that is to add a link at the top and bottom of the article that will take people to the list of all articles in the Jibe1 category. These links take you to the entire list of articles in the Jibe1 category. The URL that will bring people to the list of all articles in the Jibe1 category is http://education.reactiongrid.com/AllPages.aspx?Cat=Jibe1. – What’s the easiest way to edit a page? When you are viewing an article that you want to edit, click the Edit button in the upper right part of the page. 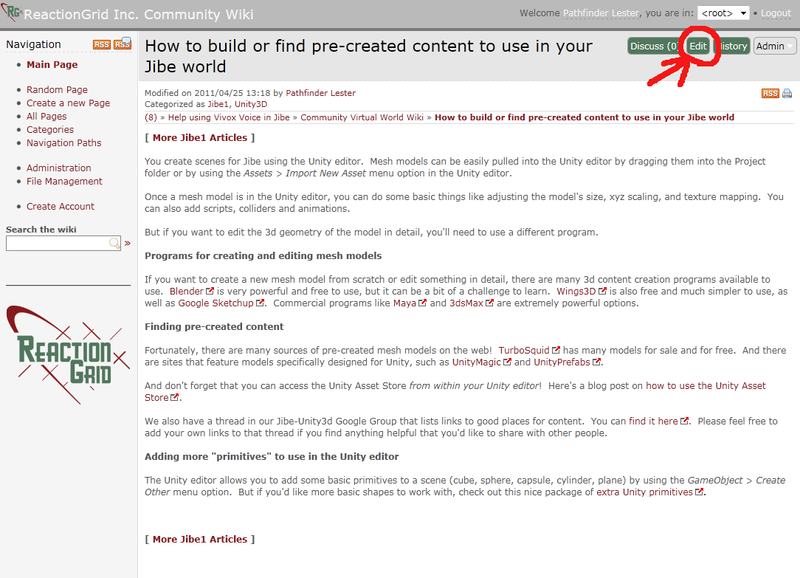 By default, the wiki will open the page editor in Wikimarkup mode. You should immediately switch to Visual mode by clicking the Visual tab in the editor. It’s a heck of a lot easier to edit articles in Visual mode! Editing an article. Go into Visual mode right away! You’ll also notice a section in the article editor called Page Categories. That’s where you can choose which categories you want an article to be listed under. 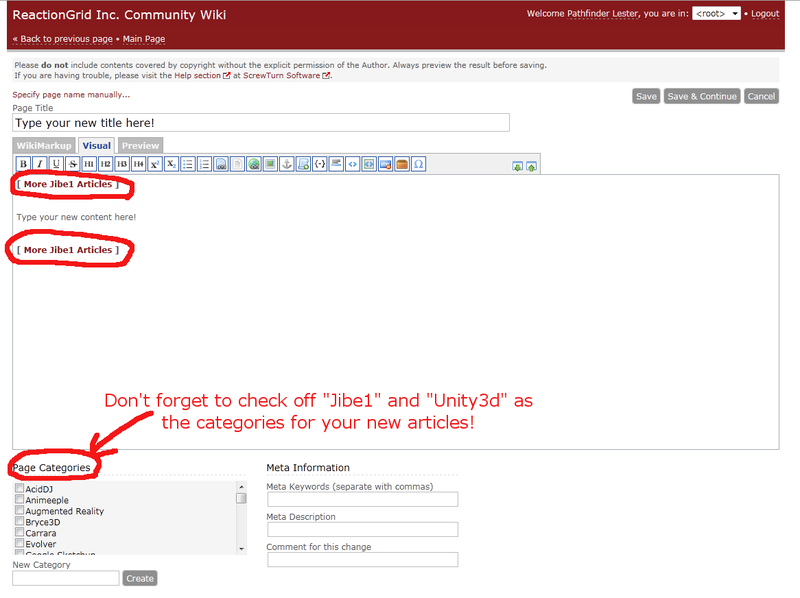 I suggest you place any new article about Jibe in both the Jibe1 and Unity3d categories. 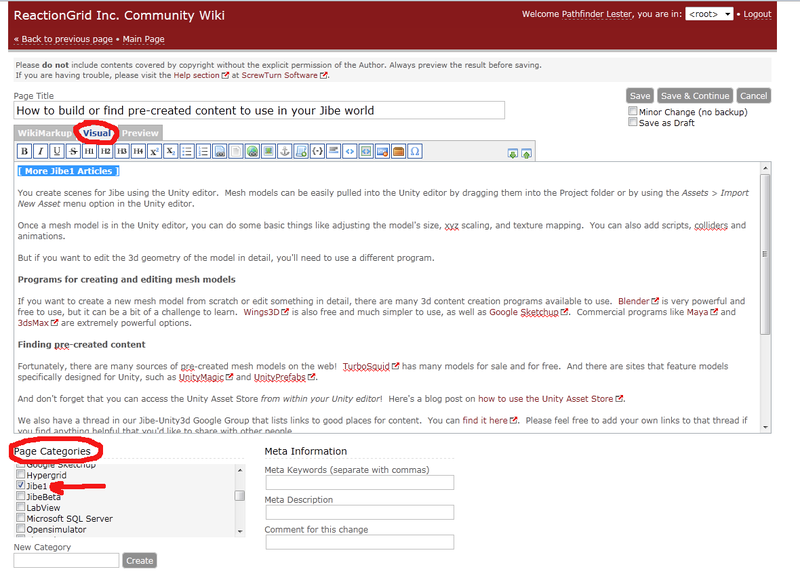 – How to create a new article in the wiki. Go back to the main wiki page, and you’ll see a link called Create a New Page on the left. 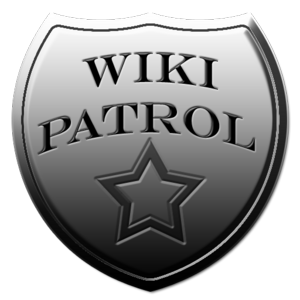 Creating a new article in the wiki. Be sure to click the Visual tab right away so that you’re in Visual editing mode. Experiment with the different buttons at the top of the editing window to add things like formatting, hyperlinks and embedded images. And remember to add a link to the Jibe1 category list of articles at the top and bottom of your page to make it easy for folks to find more articles about Jibe. Click the Save button when you’re done. That’s it! 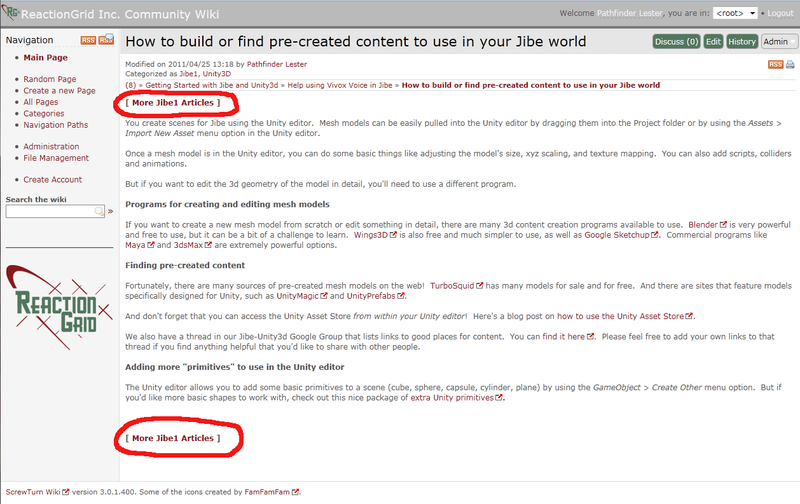 Try creating a new wiki article and sharing your knowledge of Jibe with the world. The more we all contribute to the wiki, the better we’ll help our community grow. This entry was posted in Announcements, Avatars, Education, Jibe, Unity3D, Virtual Worlds and tagged avatars, education, Jibe, metaverse, online communities, ReactionGrid, Unity, Unity3d, virtual worlds, wiki by John "Pathfinder" Lester. Bookmark the permalink. Congratulations ! John, very good article! Thank you. Excellent! Logged on and can add/edit pages. Yea! But, we still need to add to the Main Page your statement about starting with Categories and needing to log in (in upper right) to add/edit. Good point about the Main Page. I’ll make some tweaks to it as you suggested. Thanks for the feedback!